Add flour to a large bowl and form a well. Add yeast, salt, vegetable oil, and water to a bowl and knead for approx. 6 min., or until dough is elastic. Add some flour and knead the dough by hand, then cover with a kitchen towel and let rise for approx. 2 hours. Transfer rested dough to a lightly floured work surface and knead thoroughly. Divide dough into equal-sized pieces using a bench scraper. Preheat oven to 220°C/425°F. Add honey to a large pot of simmering water. Roll each dough piece into a rope and join the ends to form a circle. You can also gently press the dough into a circle, and push a finger through the middle to make a hole. Transfer the bagels to the simmering water with a slotted spoon and let simmer for approx. 1 min. Transfer to a baking sheet and bake for approx. 15 – 20 min. Enjoy with your favorite spreads! Preheat oven to 220°C/425°F. Add water to a large pot and bring it to a boil, then reduce heat to a simmer. Add honey, if desired. Boil bagels in batches for approx.1 min. per side. Remove bagels with a slotted spoon and transfer them to a baking sheet. Bake for approx. 15 – 20 min. at 220°C/425°F, or until the bagels begin to brown. Enjoy! 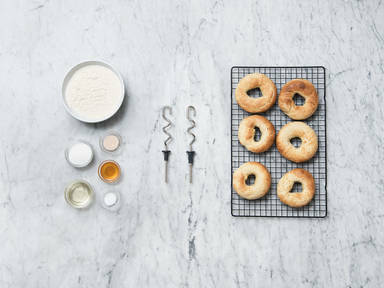 Remove bagels with a slotted spoon and transfer them to a baking sheet. Bake for approx. 15 – 20 min. at 220°C/425°F, or until the bagels begin to brown.